rec. Sinfonie an der Regnitz, Bamberg, Germany, 2-4 December 2003. DDD/DSD. also available as an mp3 and lossless download from Passionato.com – here. I obtained this recording as a download from Passionato.com and had intended to include it in my next Download Roundup, but I was so impressed with the quality of the performance that I felt that it needed more detailed analysis, especially as it seems to have passed us and other reviewers by when it was first released. Bruckner’s Third Symphony is sometimes known as the ‘Wagner symphony’ for reasons which the current recording of the first version makes clear, though some of the quotations and hints of Wagner’s music were removed in later editions. All too often performances of Bruckner sound as if the same thematic material is being repeated ad nauseam – you leave the room to make a cup of coffee and return to apparently the same few bars that you were hearing before you left, so that the joke about Vivaldi writing the same music 500 times seems even more applicable to Bruckner. Actually, it isn’t true of either composer but, while it seems almost impossible for any conductor to wreck Vivaldi, it’s all too easy with Bruckner, as some of the routine performances of his music which appear on BBC Radio 3’s afternoon schedule make clear. Even some performances of the wonderful ‘Romantic’ Symphony (No.4) can sound very routine. 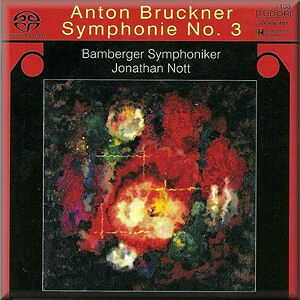 To that august company of Bruckner conductors I must now add Jonathan Nott. I had already been impressed by his Mahler: my colleague Dan Morgan made his version of the second Symphony, the ‘Resurrection’ Symphony, his Recording of the Month and the same qualities inform this Bruckner recording. The opening movement is marked, in a mixture of German and Italian, gemässigt misterioso, measured and mysterious. The danger, as with any Bruckner performance, is of launching into a climax too soon, a temptation which Nott wisely avoids, so that the climaxes when they come arise all the more effectively from the measured and mysterious background. Yet, for all that he gives weight to the different aspects of this movement, Nott keeps the momentum going forward, though with no sense of relentlessness. As in the first movement, Nott is careful in the second to give full weight to the two markings, adagio and feierlich. The music comes out as perhaps more hopeful and anticipatory than celebratory – the literal meaning of feierlich – but that’s appropriate for this stage in the development of a Bruckner symphony. In fact, listening to this movement again, having allowed the interpretation to grow on me, there is a truly celebratory mood in the last 3 minutes or so of the movement, though it’s also tinged with some deeper thoughts which a less sensitive conductor might have smoothed out. Comparisons are bedevilled by the differences between the various revisions of this symphony, with Nott making a very strong case for the 1873 original, but timings for this movement range from 13:42 (Wand with the Cologne Radio Symphony Orchestra on RCA – recently deleted) to 21:14 (Bolton and the Salzburg Mozarteum Orchestra on Oehms OC722 – a Gramophone Editor’s Choice – see Terry Barfoot’s review) both employing the 1889 third edition. Nott allows the music more time to breathe than any other version that I know, even allowing for the fact that he employs the longer first edition, taking 22:34, and he doesn’t seem a minute too long. Nott’s scherzo is ziemlich schnell, fairly fast, as instructed: this offers a real contrast with the preceding movement, where he has allowed the music time to breathe, while the allegro finale blazes out as a real tour de force. The Bamberg players sound fully the equal of any of their rivals on other recordings, many of them much better-known. The recording is very good in the Passionato.com lossless download: there is also a less expensive mp3 version. I wasn’t able to hear the 5.1 SACD track, but the CD equivalent should satisfy all except those who demand surround sound, so this recording may be confidently recommended, even to those who already have another version of this symphony. Even with so many competitors – I was surprised to see over 25 versions currently available – this Tudor recording deserves a place near the top of the list, especially as it makes such a strong case for Bruckner’s original thoughts.